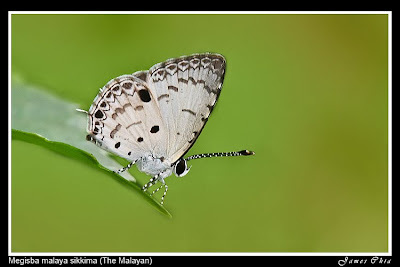 The Malayans are small butterflies. Above, both sexes are dark brown with a white discal patch which is more prominent in the female. The underside is white to dull grey. The forewing has a series of costal spots, one spot in the cell, a cell-end bar, a postdiscal curved series of transverse spots or short bars from costa to dorsum, a submarginal series of broader transverse spots and a thin anticiliary line. 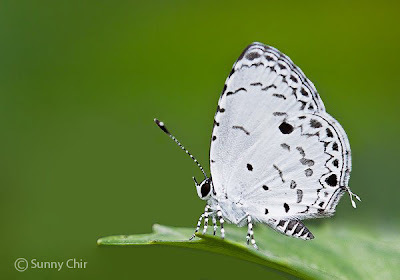 The hindwing has three spots near base in transverse order, a large prominent black spot near the apex, a cell-end bar, a broken postdiscal series of faint spots, and as in the forewing, a submarginal series of broad transverse spots and a thin anticiliary line. A pair of short tails is found at end of vein 2 in the hindwing. Elsewhere in the region these tails might be absent in some races, but the species found in Singapore has consistently been found to possess the tails. 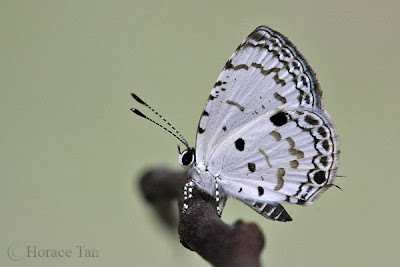 One Malayan perching on a leaf in the nature reserve. Another Malayan on another perch. The Malayan was not recorded as being extant in Singapore by early researchers, and it was only discovered recently in surveys conducted during '90s. 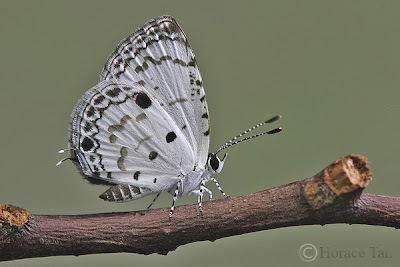 A casual look would easily have one mistaken it for the Common Hedge Blue (Acytolepis puspa lambi). The two species can be separated by checking the color of the upperside and the presence/absence of costal spots on the forewing underside. 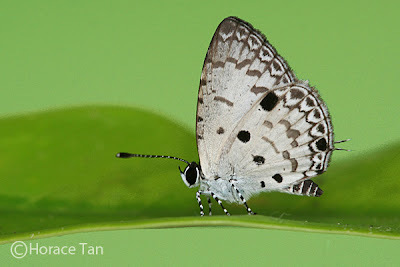 The adults of the Malayan have a weak erratic flight and can be found both the nature reserves and the Southern Ridges in wooded areas, particularly in the vicinity of its local host plant. The males have been observed to puddle on damp patches, animal dung and bird droppings. 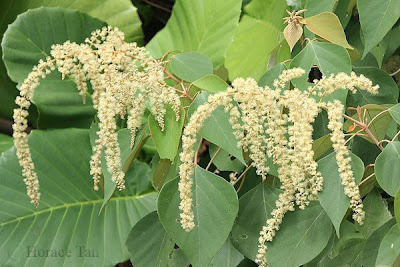 Mallotus paniculatus is a bushy tree with ovate and pointed leaves about 12-17cm long. The leaves are whitish to pale brown and thinly scurfy on the underside. Fruits are 3-lobed spiny, about 1-1.2cm wide, and are found on large panicles. This is a common tree found in waste lands, track sides in the nature reserves and the Southern Ridges. 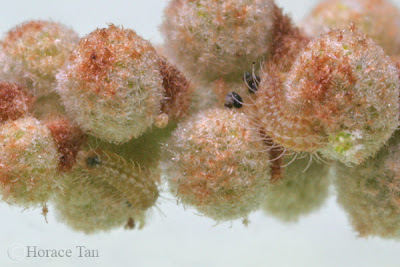 The early stages of the Malayan feed on the flower buds and flowers of this host plant. Clusters of flower buds of Mallotus paniculatus. 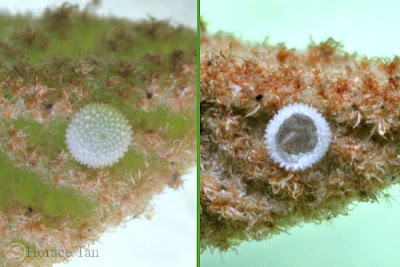 Eggs of Malayan are laid singly at a flower bud, rachies or pedicel near the flower buds. The egg is small (about 0.4-0.5mm in diameter) and light green in colour, circular with a slightly depressed micropylar area and a reticulated pattern of intersecting ridges. 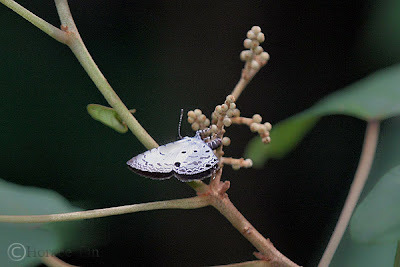 A mother butterfly laying her eggs at a cluster of flower buds of Mallotus paniculatus. 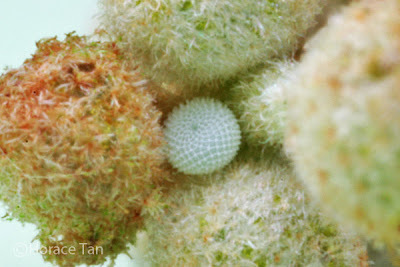 An egg of the Malayan laid among the flower buds, diameter: 0.4mm-0.5mm. An egg of the Malayan: Freshly laid (left); Empty egg shell (right). Three days later, hatching takes place after the young caterpillar has nibbled away sufficiently large upper portion of the egg shell to emerge. Measured at a length of about 0.8mm-0.9mm, its pale yellow body is cylindrical in shape, sporting long fine setae (hairs) and a dark head capsule. With the egg laid amongst or near the flower buds, the newly hatched has no problem finding its food supply. It works its way through the tomentous surface of the flower buds and bore into it for the goodies within. As it feeds and grows, it gradually takes on a pale brown base color with series of small pale yellow patches running sub-dorsally and spiracularly. 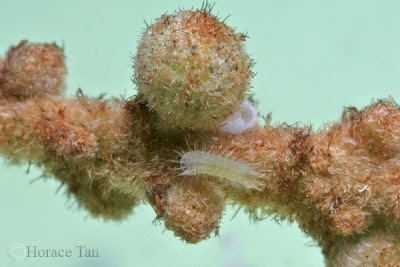 After about 3-4 days of growth and reaching a length of about 2mm, the caterpillar moults to the next instar. 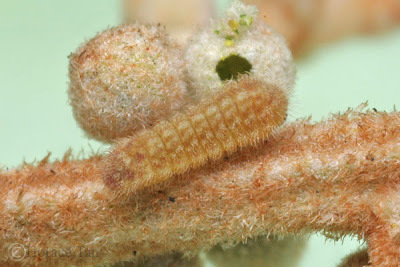 The 2nd instar caterpillar resembles the late 1st instar caterpillar in body color and markings, but the setae are now much shorter in proportion. 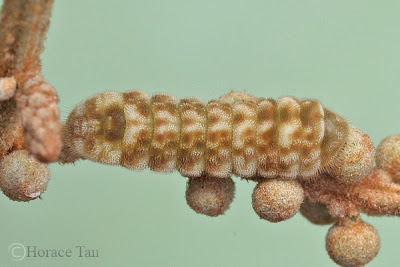 The 2nd instar caterpillar reaches a length of about 4mm, and after about 4 days in this stage, it moults again. 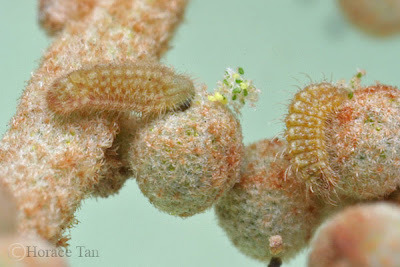 The 3rd instar caterpillar has proportionately shorter but still numerous body hairs. 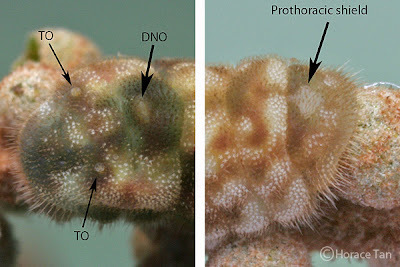 The sub-dorsal pale whitish patches run from the 2nd thoracic segment to the 6th abdominal segment, larger on the first twto segments. The dorsal nectary organ (on the 7th abdominal segment) is ringed in dark brown markings. 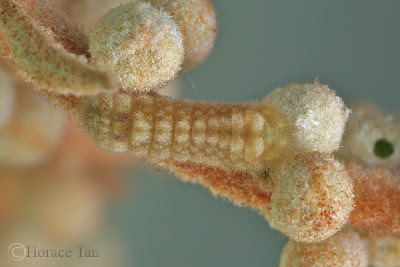 This instar takes 3-4 days to complete with the body length reaching about 5.5-6mm. 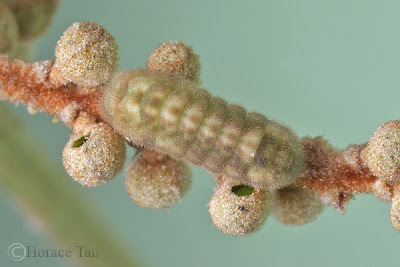 The 4th (and final) instar caterpillar is more striking in general appearance as there are prominent white patches interleaved with smaller pale brown to green patches. There are numerous tiny "asterick"-shaped specks, of white, brown and green coloration, sited at the base of setae. These structures could serve as mechano-receptors or might be glandular in nature. At a larger scale, the typical lycaenid nectary organs (both the dorsal nectary organ on the 7th abdominal segment and tentacular organs on the 8th abdominal segment) are now easily spotted. 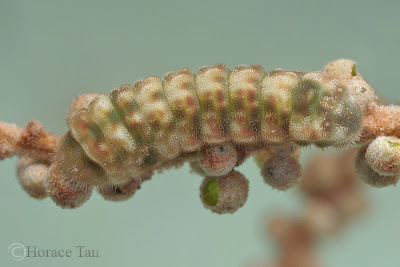 After 5 days of growth and reaching a maximum length of around 8.5-9.5mm in the final instar, the body of the caterpillar gradually shrinks, and takes on a pinky coloration. Soon the caterpillar seeks out a spot on the stem amongst the flower buds or the surface of an adjacent leaf to station itself. At this site, it enters the pre-pupatory phase where it readies itself for pupation by spinning a silk girdle and a silk pad. The caterpillar secures itself to the silk pad via claspers on its posterior end. 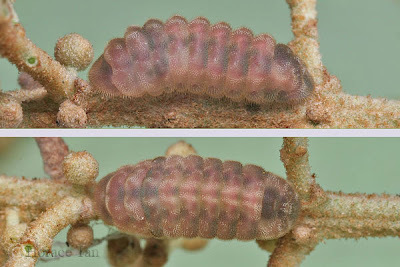 Two views of a pre-pupa of the Malayan. Pupation takes place after one day of the pre-pupal stage. The pupa has the typical lycaenid shape. It is pale yellowish brown with a hint of pink. The surface is covered with a layer of short fine hair, and decorated with a few brown and black specks. Each pupa has a length of about 6.5-7.5mm. 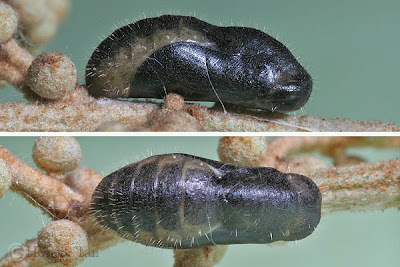 Two views of a fresh pupa of the Malayan. Five days later, the pupa becomes darkened in color signaling the imminent emergence of the adult. The next day the adult butterfly emerges from the mature pupa to begin the next phase of its life cycle. 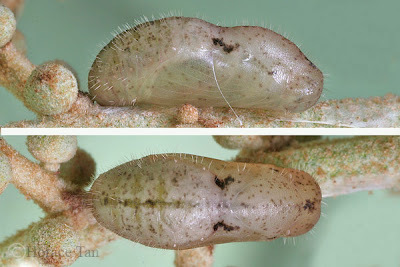 Two views of a mature pupa of the Malayan.